Harvard Business School professor and brand consultant Thales Teixeira—whose research focuses on the marketing principles of the attention economy—says advertisers are fighting blind when it comes to vying for consumer attention. Imagine that you’re blindfolded and willingly throwing money into a pit as you fight battles beyond your means. It may sound far-fetched, but that’s exactly what’s happening with brands and their advertising spend right now. I know this firsthand. I research, teach, and practice the marketing principles of buying, selling, capturing, and using consumer attention efficiently. When I don’t have my professor hat on, I work to help brands navigate this battlefield. Based on my research and experience, I’ve come to a sobering conclusion: The advertising industry is broken. As the volume of video content has exploded in the past few years, consumer behavior changed drastically, and the advertising industry failed to adapt. Today the attention paid to ads is not equal across screens and mediums, but advertisers aren’t accounting for that properly. If you aren’t familiar with the concept of the attention economy, it’s based on the fact that consumer attention is limited and always comes at a price—that price has skyrocketed in recent years. Every single day, there are more companies, with more brands and more products to advertise, which means there’s more demand for consumer attention than ever. When you take demand that greatly outweighs supply, and throw in the rapid transformation of consumer behavior, you have a recipe for waste. 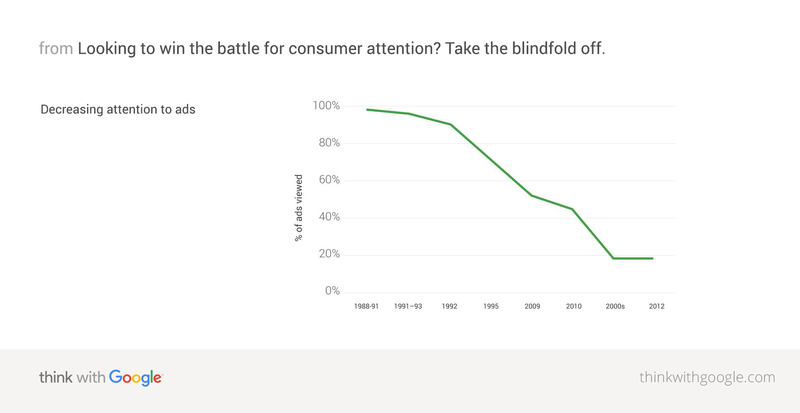 The problem is, the supply of consumer attention simply hasn’t kept pace with this demand: There’s no evidence individual human attention capacity is growing. Nor has the population grown as fast as the number of brands has. But what has changed is how quickly consumer behavior evolves. For example, the way people use any given social media site is constantly changing. So when you take demand that greatly outweighs supply, and throw in the rapid transformation of consumer behavior, you have a recipe for waste. Especially when you consider the increased pressure on CMOs to show bottom line results. It’s no wonder CMO turnover has reached a new high. Lest there be any misunderstanding, ad effectiveness is not down across the board—only when it comes to mass, traditional media, which doesn’t hold attention like it used to. Despite the increasing cost and decreasing quality of attention to TV, advertisers are still wasting money with a “spray and pray” approach on traditional media instead of moving spend to digital. Unless yours is a rare brand whose products truly appeal to all, you should only spend on media that allows you to accurately target, measure, and pay appropriately for the attention you receive. Often, making this shift will require overcoming serious risk aversion, inertia, and incompatible resources. But the payoff is speed, precision, and power. How much attention someone will pay to an ad depends on countless factors, such as what that person is thinking about in the moment, what’s competing for their attention, what they were just doing, the context of the ad, the creative execution itself, and its relevance to the individual. Some of those factors you can’t control, but the creative execution is one that you can. My research points to a few creative principles that consistently drive increased attention (as measured by intensity of focus and time spent with an ad). Fighting blind in the battle for attention is not a life sentence. It’s a choice. The first time you present a customer with your brand, you shouldn’t ask them for several minutes of their attention, upfront, all at once. That’s like asking someone to a three-hour dinner for a first date—you have to work up to that. Start with something quick and simple, like a coffee. If that goes well, you can build on it. The next step might be lunch, and, over time, you can work your way to the big dinner. This marketing principle is known as the ladder of engagement. The idea is to build relationships with your brand incrementally, with small asks of attention before big ones, so that you can earn customer attention—or else you’ll never be able to keep it. Using various ad lengths is a good way to do this. For instance, try serving short ads initially, then working your way to long-form, more cinematic ads. You could also try sequential storytelling by breaking involved stories into several parts, and remarketing to viewers so they see the ads in sequence. There’s no magic formula for earning a potential customer’s attention, but there are certain principles brands can lean on, including those I just outlined and many more. At a higher level, there’s one simple question I encourage you to ask to determine a game plan for navigating today’s increasingly complex attention economy: Are you spending on the right platforms, and are you leveraging the tools of each in a way that will help you capture and keep consumer attention? Answer that honestly, and you’ll be on your way to a fairer fight. 3 Teixeira, Thales. "The New Science of Viral Ads." Harvard Business Review 90, no. 3 (March 2012): 25–27. 4 Teixeira, Thales S., Michel Wedel, and Rik Pieters. "Moment-to-moment Optimal Branding in TV Commercials: Preventing Avoidance by Pulsing. "Marketing Science 29, no. 5 (Sept–Oct 2010): 783–804.